Woot woot! I am finally DOING a (small) project I saw somewhere (FB) and wanted to do. Normally, I never get a round to it... but the stars aligned on this one LOL First, here is the post on FB. And here are the simple directions: Orange peels, vinegar in a quart jar, let sit for 10 days or so...strain out the liquid and use as an all-purpose cleaner. Easy, cheap, natural, smells good! 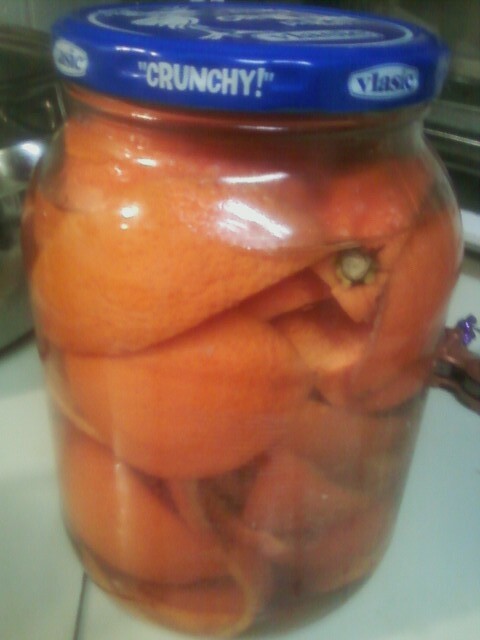 First, I must explain/disclaim LOL I had a lot of oranges to use...because I bought a bunch for the Light of the World retreat at church (as church kitchen coordinator.) I had to help provide snacks, breakfast, more snacks and more snacks for 2 1/2 days and that included people on diets, gluten-free people, vegans, etc. So I bought some fruit...grapes, apples which I think I forgot to set out other than one time, bananas, and...the sweetest juiciest little seedless oranges ever...they didn't look like much but I tried them and new they were so good. So I cut them into wedges to help the finger-food peeps handle them easier. And...they sat there, and sat there....untouched. The whole weekend. WHAT GIVES! @ LOL I don't know....I guess since they "didn't look like much", like I said, then they thought they weren't good? But anyway, I had a lot of extra oranges left over...I still do...I mean, I love oranges, but I can't eat that much at a time, or I get "discomfort." LOL And my kids aren't that into them...at all. 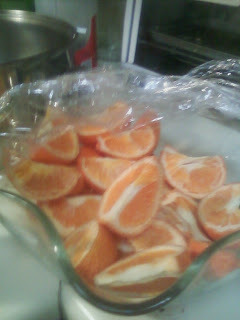 Only two will eat the canned mandarin oranges...but for some reason, not the fresh peeled ones. Argh. Anyway, so this whole jar/cleaner project was perfect for my bowl full of orange wedges...and I took the leftover "insides" and a few of the peels and ground them into my garbage disposer for a wonderful deodorizer :) Love doing that...I did that at the church too, for the garbage disposal in the kitchen. It needed it badly LOL I may have to do more intervention there. :P But anyhoo....now you know the story of my oranges....I forget the real name of this kind...not clementines, but similar. On sale at Sams' LOL Oh and I also used apple cider vinegar since that was what I had on hand this time...someone had suggested it in comments I read somewhere. I am going to try this! 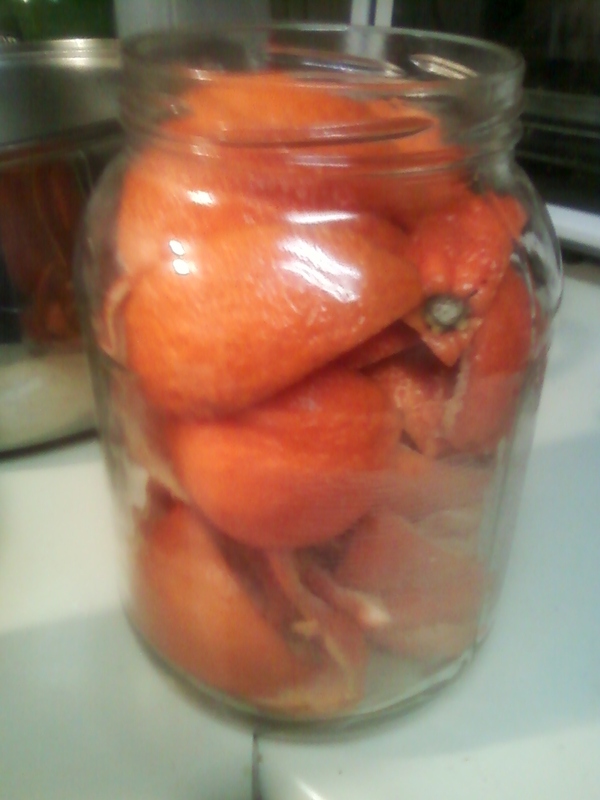 I often buy oranges and we don't eat them all and they are in danger of being thrown out. I saw a cleaning recipe on my sister's blog for a lemon cleaner which I like the sound of too, but I rarely have left-over lemons. Only 10 days to wait. Sounds good!